Total applications to Emory University’s undergraduate programs have hit an all-time high this year, surpassing 20,000 applications for the Class of 2019, according to a Jan. 29 University press release. Compared with last year, applications to Emory College of Arts and Sciences increased 15 percent to 20,477 and applications to Oxford College increased 30 percent to 9,653. In 2015, Emory College plans to enroll 1,350 students, and Oxford College plans to enroll 490. Assistant Vice Provost for Undergraduate Enrollment and Dean of Admissions John Latting wrote in an email to the Wheel that the admissions numbers this year surprised him, noting that a 15 percent change in applications is unusual at any university. There was also an increase in for Early Decision I (ED I) and Early Decision II (ED II) applications, where students are obliged to go to Emory once accepted (ED II indicates applicants apply at a later date than ED I). Emory College received 1,253 ED I applications for the Class of 2019, up 9.6 percent from last year, and admitted 478. Emory College received 1,244 ED II applications and Oxford College received 639 ED II applications, a record applicant pool for the ED II admission plan for both colleges. These numbers indicate that a higher number of applicants chose Emory as their first choice university this year. Potential students on “Why Emory?” Graphic by Brandon Fuhr. Despite being surprised by the significant increase in application numbers, Latting had a few theories on why application numbers increased. Latting wrote that the increase probably had to do with a combination of the actions of the Office of Undergraduate Admission, Emory in general and of broad economic forces that go beyond the University. He added that the extensive media coverage for the impressive activity at Emory, including treatment of patients infected with the Ebola virus, may have also helped. He also cited the strengthening of the U.S. economy as another possible factor in the increase in applications. Latting added that although the large number of applications this year won’t change the qualities Emory looks for in applicants, the number will change the percentage of applicants who are offered a place at Emory. “The admit rate will fall this year,” Latting wrote. Several students interviewed indicated Emory was their second choice, but asked not to be identified in order to not affect their applications. In response to this, Latting wrote that admission decisions are not at all affected by where Emory stacks up in the preference of universities for students when they apply. “We admit the students who would most benefit from and contribute to Emory, and then work hard to make Emory the first choice of everyone admitted through extensive recruiting activities in April,” Latting wrote. Subhash Gutti, a regular decision applicant from Eastern Kentucky, wrote in an email to the Wheel that as an aspiring pre-med student, he was drawn to Emory’s educational standards and the opportunities offered by Emory. 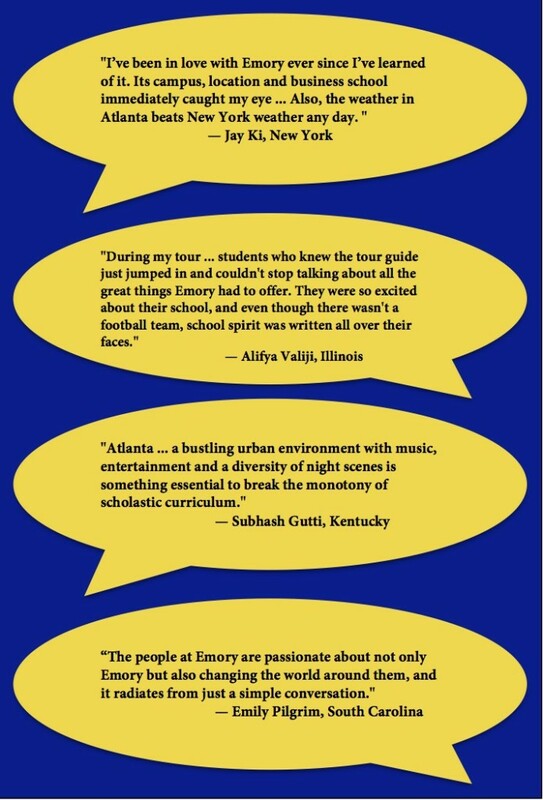 Gutti also wrote that Emory’s location in Atlanta is a huge attraction for many applicants interested in Emory. “A bustling urban environment with music, entertainment and a diversity of night scenes is something essential to break the monotony of scholastic curriculum,” he wrote. XinNi Chai, a regular decision applicant from California, also wrote in an email to the Wheel that Emory was her first choice. Emory is Abdulla’s first choice, she wrote.